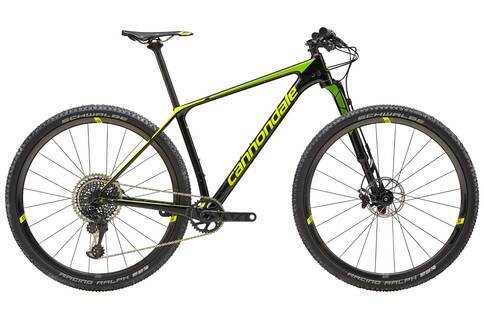 The Cannondale F-Si is quite possibly one of the most innovative hardtail XC bikes currently on the market. From the BallisTec carbon material to the asymmetric integration, this mountain bike is designed not just to finish, but to win. The specs are one thing, but the ride speaks for itself. With Cannondale’s history in the mountain bike industry, we had high expectations when getting ready to review the Cannondale F-Si range. Given the quality of the specs for this high-end series, we expected an excellent performance on the test ride. With Cannondale’s use of asymmetric integrated systems, the short chainstays allow for the right about of stiffness and traction. In combination with the high-strength carbon frame, the bike seems to offer a comfortable yet powerful handling. This bike took on some pretty rough terrain without breaking a sweat. Overall, this bike was super efficient, and the high-speed stability is unparalleled. The Lefty fork on this serious may not go down well with everyone, but we felt the bike has some nice damping and stiffness because of it. It also has a superior offset compared to competitors, just perfect for that low speed agility you need, while adding to the stability at higher speeds. Cannondale F-Si bikes are a cross-country powerhouse, giving you easy handling on any terrain with its stability, traction, and agility. The Cannondale F-Si bikes are by far some of the best we’ve reviewed, but it’s really hard to argue with the advantages of just about anything Cannondale comes up with. For a high-end bike with a high-end price, this baby delivers a killer cross-country racing experience. So far, Cannondale has yet to disappoint!